Robert devotes his practice to representing folks who have suffered serious injuries because of someone else’s actions. He has extensive trial experience. Among other victories, he has won a large jury verdict on a car wreck case against one of the best defense lawyers in the state and a $600,000 settlement for a slip and fall case against a large corporation. Robert also achieved a $2.95 million settlement for a client injured in a car wreck. Robert specializes in holding corporations, insurance companies and individuals accountable who injure his clients in: car collisions, tractor trailer collisions, dump truck collisions, delivery truck collisions, and motorcycle collisions. Robert also represents those who have been injured due to medical malpractice or a defective product. He has studied and developed a specialty in brain and head injuries, spine injuries, as well as injuries to children. Robert uses cutting edge technology and graphics in ways that few other lawyers can. Robert has transformed cases that other lawyers said were worth very little to nearly seven figure settlements. The secret: Say what you mean and mean what you say. 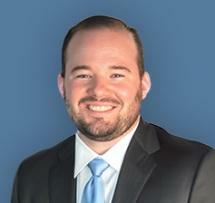 Robert credits his mentors for his extensive litigation experience and success so early in his career. His then boss and now law partner taught him how to try cases and fight for his clients, and gave him the tools necessary to do so. Unlike most lawyers in his generation, Robert developed his skills in the courtroom with dozens of trials under his belt as well as arguing before the Tennessee Supreme Court Panel very early in his career. An East Tennessee Judge once compared Robert and Tony’s trials to listening to Mozart because of their precision and effectiveness. Robert studies Don Keenan and the Reptileâ. Robert graduated from the Keenan Ball Trial College in 2017. He teaches other lawyers across the country some of the trial techniques he has learned. Robert’s success has been recognized nationally as he was named National Trial Lawyers: Top 40 Under 40 and most recently appointed as lifetime member in the Multi-Million Dollar Advocates Forum, a select group of lawyers who have achieved some of the highest results for their clients. Robert is also a Board Member for the Tennessee Trial Lawyers Association. Robert knows that his clients are just like him. He was born and raised on a cattle farm in a small town on the outskirts of Knoxville. Growing up, his parents instilled in him values of hard work and discipline while often waking up before sunrise to work the farm. While in school, Robert played baseball and football. He earned a scholarship and played baseball at Maryville College. While in college, he also worked at Clayton Homes in Maryville and volunteered every week at the local nursing home. During the summers between college semesters, Robert worked two jobs. Upon graduation from Maryville College, Robert received a full scholarship to attend Appalachian School of Law in Grundy, Virginia. He graduated law school with honors while serving on Moot Court and Law Review. Robert met his wife, Ashley, while in Grundy, where she was attending Pharmacy School. Robert and his beautiful wife enjoy time with their oldest son, Luke, and their newest addition Josh. Robert’s family is his motivation to fight for every client. He sees himself in every injured client, his wife in every client’s spouse and family member and his sons in every injured child.